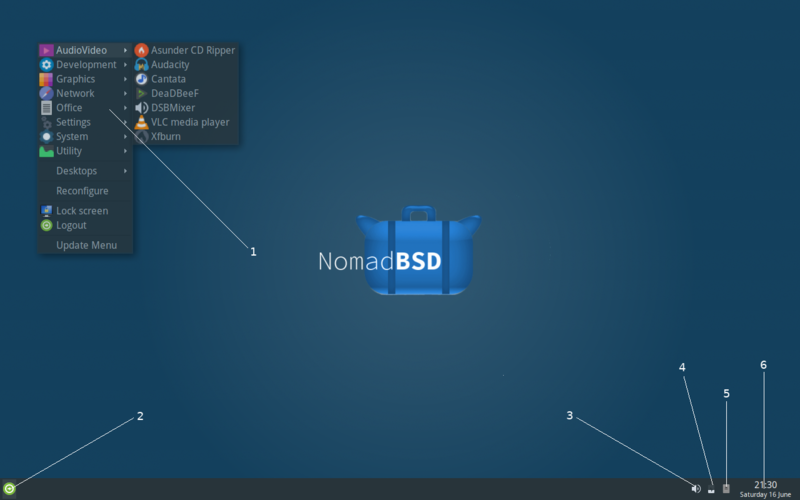 NomadBSD is a 64bit live system for USB flash drives, based on FreeBSD®. Together with automatic hardware detection and setup, it is configured to be used as a desktop system that works out of the box, but can also be used for data recovery. NomadBSD performs well on USB 2.0 flash drives, but writing many small files can be very slow. To improve performace, you should consider using a USB 3.0 flash drive even on a USB 2.0 port, as they tend to be faster. See USB 3.0 Flash Drive Roundup for some benchmarks. Instructions for writing the image to a flash drive from different operating systems can be found here. The main menu. You can reach the main menu by pressing the Windows® key (or Super key)/Cmd key (Mac®), or by right-clicking on the background image (root window). Logout button. Clicking on this icon brings up the logout menu which lets you shutdown, reboot, etc. the system. DSBMixer. By hovering over the icon you can see the current volume of the master channel. Using the mouse wheel on it lets you change the master volume. Clicking on it brings up the main window of DSBMixer. DSBBatmon. By hovering over the icon you can see the battery's current status and charge. Clicking on it brings up the configuration menu. DSBMC. Clicking on the icon brings up the main window in which you can see all the mountable storage devices attached to the system. Use the context menu of the device icons to select an action (un/mounting, opening, playing, ejecting) or double click to mount and open the device in a filemanager (Thunar). You can use the preferences menu to change the filemanager, autoplay setting, and multimedia programs. Date and time. Clicking in that area brings up a calendar. The program DSBAutostart allows you to control which programs are automatically executed when the graphical interface starts. Further, it allows you to enable/disable some components of the NomadBSD desktop. The changes take place after logging out and in again. NomadBSD comes with a bunch of pre-installed filesystems (CD9660, FAT, HFS+, NTFS, Ext2/3/4). You can mount storage devices via DSBMC (see Overview), which is a graphical client for DSBMD. to automount all currently connected storage devices, and to enable automounting on devices attached later to the system. 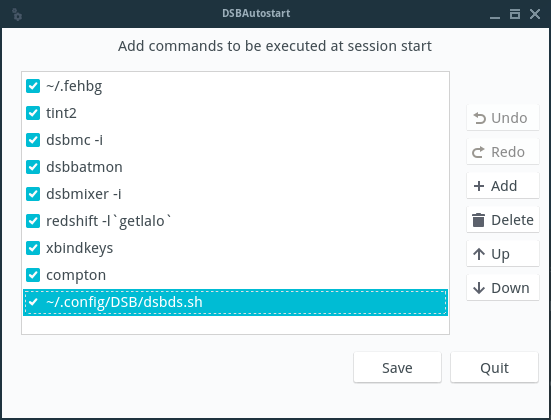 To start this command automatically on session start, open DSBAutostart, and add a new entry for the above command. The following subsections describe how to extend the filesystems support. Rebooting the system, or restarting DSBMD is not necessary. Install the package fusefs-lkl for BTRFS, ReiserFS, and XFS support.